Arkoma Surveying & Mapping. Surveying America's Infrastructure. The trusted surveying firm for those who demand detailed, professional, and expedited land surveying services from a consistently dependable and professionally licensed partner for the energy industry. Our standards for timely service and accuracy, paired with advancements in technology, have placed the right tools in our hands to bring you the results you need no matter the project size. These standards and practices are backed and maintained by our experienced and skilled employees who not only add value to our product, but excel in their ability to continually produce results that exceed every expectation. Our partnerships are based on the mutual understanding of the importance of producing a dependable service they can continue to rely on, time and time again. We help to reduce industry "idle time" for our partners by equipping our crews with the latest in technology to allow them to communicate and transfer data directly to our offices from anywhere in the field. By reducing or eliminating the time between steps in our own process, it allows us to deliver products in a timely and more efficient manner. We understand that time is money, and the least amount of time waiting for results means fewer expenses for our partners. Working closely with operators, engineers, and landmen to safely scout and plan the expansion of the energy industry's infrastructure, we offer Surveying Services and Drafting Services to expedite your needs with flexible scheduling and accurately detailed results. 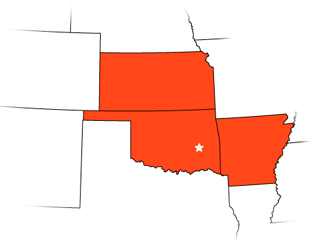 Our experienced mobile crews are located throughout several key areas in Oklahoma, Kansas and Arkansas. Strategically placing our skilled crews closer to the field reduces expenses for our energy partners. Safety is a state of mind, it's an attitude and it's the way of life for the Arkoma Surveying and Mapping family. From daily tailgate meetings (complete with JSAs) for individual crews, to companywide annual OSHA training courses including SafeLandUSA orientation for all field crews, we take safety seriously. Our crews are equipped with hard hats, safety glasses, fire-resistant clothing, fire extinguishers, H2S monitors, safety vests, snake chaps, gloves, ear plugs, steel-toe boots and First Aid kits. Who says you can't have price, quality and service? Our expedited services and standards in quality result in shorter turnarounds and a more accurate final product. Repeat business with our partners has become our benchmark for quality. We strive to be the best in our industry, and our reputation precedes us with every commercial energy partner we work with.